It was the perfect description to our time in the beachside town. The vibrancy includes the colorful graffiti, but is also apparent in the people and the lifestyle of everyone who comes here. I met multitudes of people that had shown up with the intent of a 1-2 day stay in Valparaiso that turned in to 2 weeks, and in some cases an entire month. 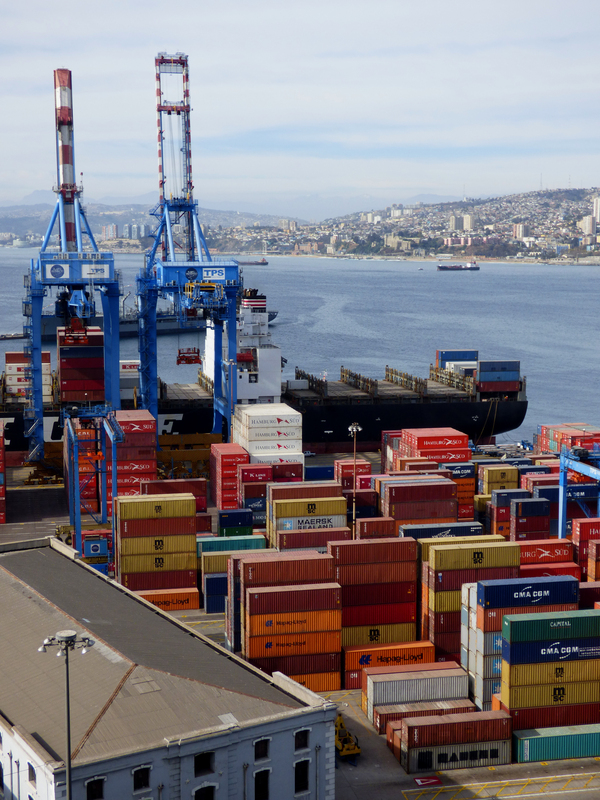 Valparaiso is a city that brings a smile to your face, flows creativity in to your thoughts and actions, and has fresh markets that make even dinner a piece of delicious art. Chase and I arrived with the intent of staying 2-3 days, and ended up far longer. It was well worth the extra few days! Fresh off the bus, surrounding the station is a market. We didn’t get to truly explore it until our third day, but it is remarkable. The fruits and vegetables are the largest and most colorful that I have ever seen in my life! It is all so fresh and the best I have ever tasted as well. Besides fruit and vegetables, there is a fish market and rooms full of spices as well. The way it is all shaped and forms together as a giant maze allows for a good flow of people, but doesn’t have any sort of organization. Personally, I love it though! Why? Well, we all go through a supermarket, get to checkout, and then realize what we forgot. Wandering through this market, we got everything we needed, and when we realized we had forgotten bread, there was another place just ahead to get more fresh bread! It is ideal for the disorganized shopper in all of us… 😉 The first time we walked through the market, it was with the cooking class we took. We needed many ingredients, and the teacher walked us through, teaching us about the local fruits, meats, and what else to look for. As we made our way through the market, I learned quite a few interesting facts. Chile exports almost all of the fruits and vegetables that they grow in the country. This made me ask, “How do they decide what goes and what stays?” It was actually a surprising answer. As we all know, fruits and vegetables have a limit on how much pesticides can be present when exported and sold. 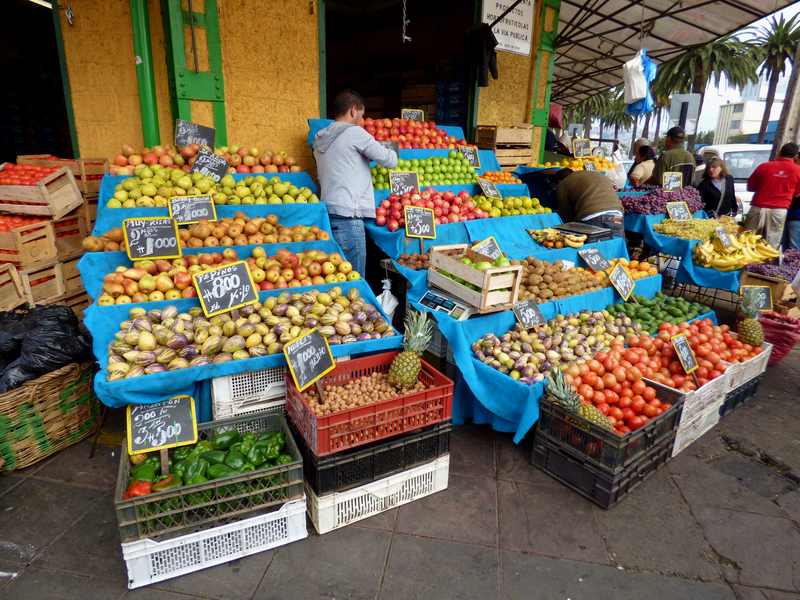 So, all the vegetables and fruits that don’t pass that test, but are still perfectly healthy for use, are kept in the local markets in Valparaiso! Good to know, huh? After exploring the markets, Chase and I got continued on in to our cooking class. Throughout the class, we cooked 6 different courses, made pisco sours (the local drink here in Chile), and tasted local white and red wines. It was INCREDIBLE! The amount of recipes we get to bring home is massive, and the meals and memories from that class are lifelong. 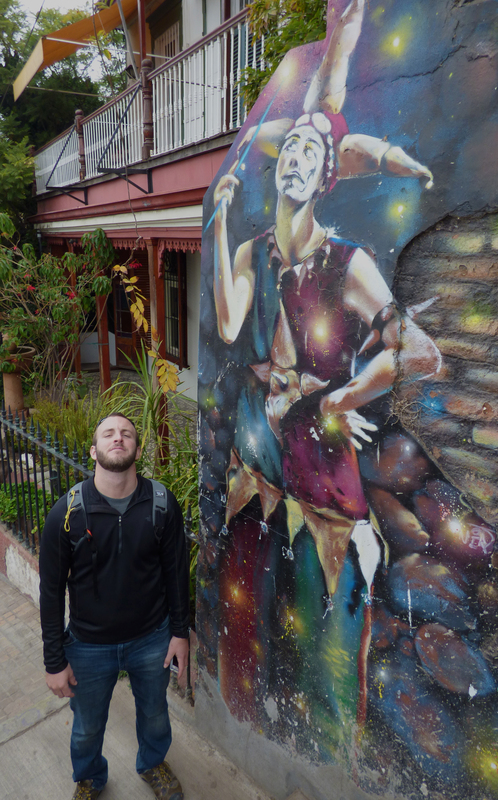 Aside from the food, Valparaiso had still more to offer. As we walked around, we got lost in the streets. Most of them are cobblestone and one way. I pity any foreigner in a car trying to explore for the first time. The walls are lined with paintings and graffiti. Different neighborhoods have different styles, but they all have one thing in common: bright colors and vivd images. Some of the many I encountered included a personal rendering of the three little pigs and the big bad wolf, mermaids, and large cartoon figures playing different instruments as you walk down the street. Chase and I also got the opportunity to explore the shipping docks and the naval museum. All of the boxes that move from ship to ship are brightly colored and arranged in no particular order. As we looked over the harbor, we could see multitudes of ships, tour boats, and even one of the Chilean Navy’s huge ships that was in port for the holiday. It was amazing! The shipping boxes in the port add loads of color to the surrounding city. Our fourth day there, more importantly Thursday, was a national holiday celebrating the Chilean Navy and all of the battles won. Valparaiso is a very important town in the history of these battles as well as the navy, so the President of Chile was also in town to speak! Fortunately for me, everyone in the Chilean nation is shorter than I am, so it was very easy to photograph the parades and just about anything I see and like. The parade lasted for many hours, going in to the main square, where the President was speaking. Our hostel during our stay was about a block above this square, so we had constant access to the hubbub and excitement throughout the week. 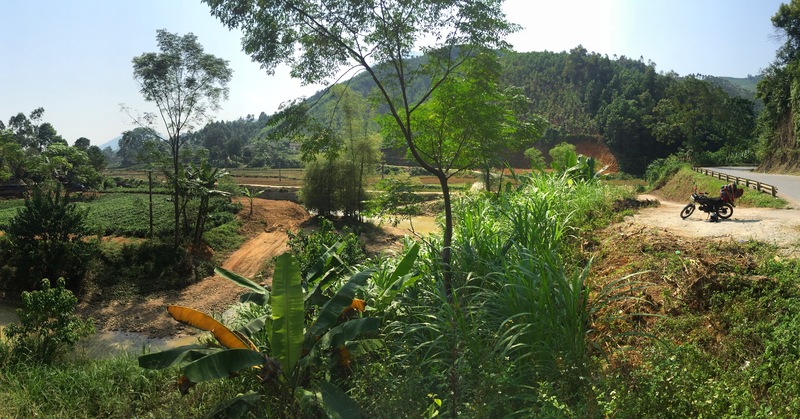 I was thrilled that we got the chance to experience all of this, especially the feeling and excitement that the locals gave off. It was a unique experience and we were blessed to have happened upon it. During all of this, there was even more happening on the other side of town near the university. Many of the students throughout Chile have had protests and marches for the education promises here that have not been fulfilled. The protest on this day, however, turned in to an all out riot. We had heard it was happening and chosen to avoid it, and that turned out to be the right thing to do. While we were enjoying the parade, the protesters had set up barriers, set the barriers on fire, and gone just plain wild with their protest! The military brought in the giant tank that had a water cannon, and shot it at people; also, they used tear gas on the larger groups to disperse them. It was crazy, and the news depicted just a small part of everything that happened. The military weapons covered quite an array of styles and types. 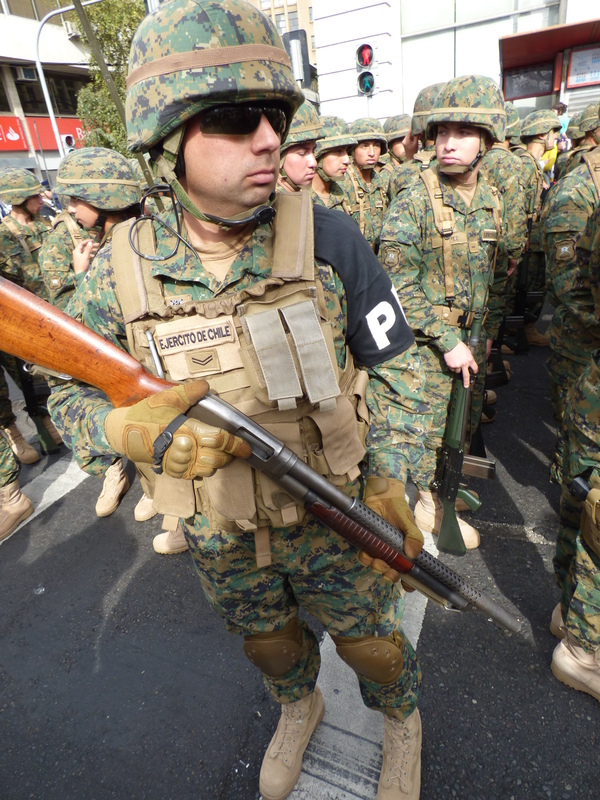 The military police walking and patrolling were equipped with modern assault rifles, the lesser patrols (like the man shown below) were equipped with shotguns, and many of the military units in the parade had old, world war 2 style rifles with bayonets and even in some cases, swords. The women’s branch of the military were issued an entirely different attire. This included “standard issue” 1-inch shiny black heels, bright red lipstick, and a shiny black purse. There were a few women in other branches, but I saw maybe 5-6 at the most throughout the entire parade. Chase and I are still trying to figure out what the purpose of the women in high heels was in the military. This short description just doesn’t do Valparaiso justice, and I am so glad that our memories and photos can preserve those memories! For now, on to the next city for more adventures!